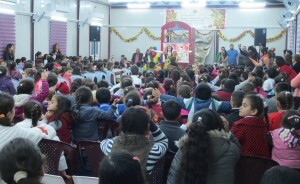 (12/24/15) Celebrating Christmas in Iraq: In 2015 the first Christmas for Refugees program was held in Iraq after several years of success in Lebanon and Jordan. The program for refugee children was a huge success there. Only two events were held for displaced children, but they were large. The first event was held for 326 children in a center for displaced persons from the Nineveh Plains. The center is located inside an unfinished multistory building that was intended to be a hotel. The second event was some distance away at a displaced persons center run by the Roman Catholic Church in Erbil. That Christmas program for 300 children was the first event ever held in a brand new meeting hall and church just completed for displaced persons from Mosul and the Nineveh Plains. The second event was both heartwarming and depressing at the same time. The joy of the 300 children attending was phenomenal as they sang, played and enjoyed music and watched both a puppet and a clown perform “magic.” On the downside the Catholic priest in charge had tried to pick out the children most in need of spiritual and material help, out of over 2,000 children of different denominations housed in the center. The Catholic diocese in Erbil has rented homes in a suburban development that failed when the Islamic State (ISIL) approached the city last year. Thousands of homes now stand unfinished and empty. Three-bedroom homes house three families each, with one family per bedroom. Some children who could not be invited came to the building hoping to get in. There was simply no room in the building and we were not prepared to order hundreds more meals. The Christmas for Refugees program would have had to host six or perhaps seven more nights in a row of the programs with 300 children each to provide for all the displaced children in this one center. The problem in attempting to do that has to do with far more than money. With this many children, each program required about forty volunteers including musicians, actors, puppeteers, security and yes, child control. Just imagine trying to keep 300 kids mostly in their seats during a high energy program that delivered the Gospel message. Logistics included moving in a stage, sound equipment, generator, 300 meals and 300 gifts from Franklin Graham’s Samaritans’ Purse project. 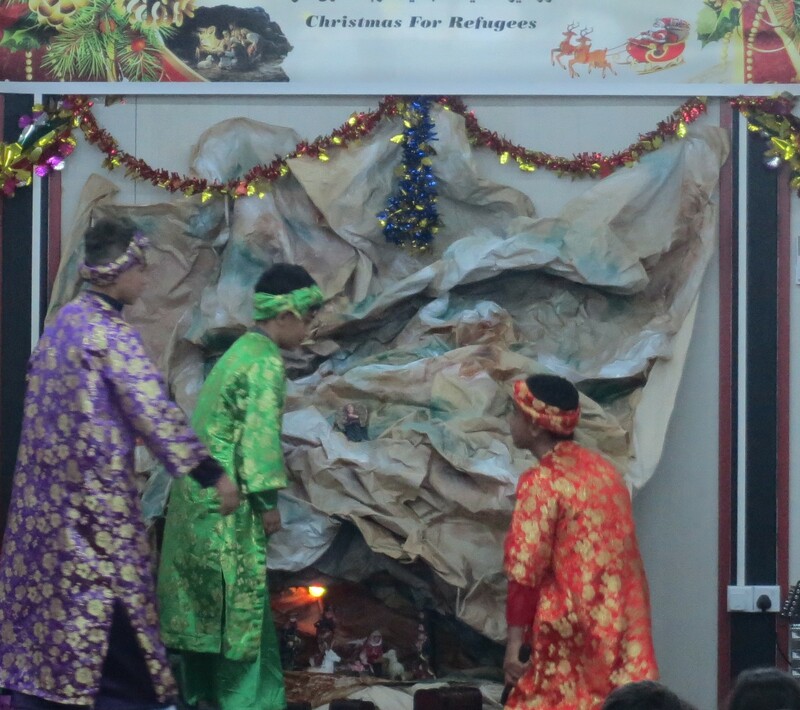 The Iraq Christmas programs were the first for Christmas for Refugees in which Samaritans’ Purse furnished gifts, although we did have to pay for the shipping to Erbil, Iraq. After a performance by clowns and a puppet show a short play of the birth of Jesus was portrayed. There was also a coloring contest as well as a hot meal and gifts. Bottom line: Even if we had the funds for seven straight nights of the program, to care for all the kids in this one center the number of volunteers needed simply could not be maintained for the entire time. With our partner ministry in Iraq we are working on a plan to help more children at this and other displaced persons centers next Christmas even if we can’t provide the entire three-hour program and meal. There are tens of thousands of displaced children in the Kurdish controlled areas of Iraq. Our partner organization implementing the Christmas for Refugees program in Iraq is evangelical, and some of the volunteers for the events had a Muslim background before accepting Jesus as their Savior. The Catholic priest had no problem with any aspect of the program presented, as denominational lines have just about vanished while all churches in Iraq suffer under the hand of the Islamists in Iraq. At a separate dinner, at a center run by an evangelical group a Chaldean Catholic priest brought about 75 of the children under his care. The programs in Iraq were extremely high energy compared to those in Lebanon and Jordan. 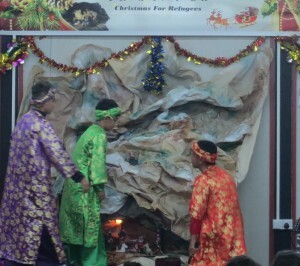 The Christmas for Refugees program provides a general outline as to how funds provided should be used. The guidelines are not strict, as national culture differ. The events in Iraq were louder and contained more imagery such as volunteers dressed as clowns. While clowns at a Christmas dinner may sound out of place to some in America, the children loved them and they delivered a very accurate Gospel message. Imagery of what Americans refer to as Santa Clause prevails among Christians in all three nations. It is not uncommon for dozens of children to show up in red and white outfits sewn together by their mothers of Christmas. Santas are displayed in churches of every denomination, often with Bibles. In the three nations, gifts given to the children varied as well. In Lebanon new items were purchased and each child received an identical gift. In Jordan each child received a bag containing small toys and treats. In Iraq our partner ministry had previously given out the Samaritan’s Purse gift boxes and wanted them for the children so we paid to have them shipped in. Meals varied as well but this year all children except one group in Lebanon were served a hot meal. Food deliveries to parents also varied. In areas where food vouchers could be used, the vouchers were given to families to buy their own food. While that was possible in Lebanon, at most events parcels had to be given to parents in Jordan and Iraq. Our costs for the food parcels varied as well and in some cases allowed us to give out additional food at some refugee centers. What all programs in all three nations had in common was the presentation of the story of the coming of Jesus as the true meaning of Christmas Day. The use of the Bible and Bible verses were central to all of the events for the children. The central purpose of the Christmas for Refugees program is not to feed children for a day but rather to reinforce the message of the Gospel and to spiritually encourage the children and their families at a bleak period in history for them and for the church. Please help make Christmas for Refugees a success in 2016 by donating today. More information here. Thank you for all you do that I can’t. We are a married couple from Austria. We want to adopt a Christian baby from Iraq or Syria. If you have any information, please help us. Thank you so much for your help. God Bless All your efforts to bring glory to our great king and God; May we all work together to help our brothers and sisters, the Body of Christ here on earth.Amen and Amen!